While LA Unified’s projected graduation rate continues to tick up this spring as seniors complete extra credit recovery courses to make up those they previously failed, 30 percent of those the district considers “on track” for graduation currently aren’t because they are failing at least one A through G class. To be labeled “on track” a student need only be enrolled in the required A-G courses, and if these failing grades do not improve to at least a D by the end of the semester, these roughly 6,400 seniors would not be eligible to graduate on time — which would drop the current projected graduation rate from 68 percent to 48 percent. Frances Gipson, LA Unified’s chief academic officer, said a number of actions have been taken to get extra help and resources to the students who are failing a course, and the district is still hopeful that last year’s record graduation rate of 77 percent will be surpassed. “We are seeking to exceed last year’s expectations, that is our goal,” Gipson told LA School Report. Due in part to a $15 million credit recovery program that has been aggressively implemented this school year, the projected A-G completion rate has risen steadily, up from 54 percent in January and 63 percent in February to now stand at 68 percent. District officials in February predicted LA Unified may graduate 80 percent of its seniors, which would be an all-time record. Gipson said the extra help being given to seniors failing an A-G course include having counselors meet with the students and letters sent to the student’s parent or guardian. School counselors “have met with all students in the class of 2016 that are currently on-track but received a fail at the 10-week mark to discuss intervention and supports needed to pass and stay on track,” according to an April 18 memo to Superintendent Michelle King from Gipson and Carol Alexander, director of A-G Intervention and Support. The credit recovery program was enacted by the school board this fiscal year to help offset a potential graduation crisis, as this year is the first time the A-G courses are required for graduation. The courses, if all are passed with a C or better, would make students eligible for acceptance in California’s public universities, although seniors only need to get a D in order to graduate. Before the credit recovery program began across the district in the fall, the projected graduation rate was 54 percent, a steep decline from last year’s all-time high of 77 percent. The credit recovery program involves getting seniors not on track to take extra coursework on weekends, after school and during holiday breaks. Many of the courses are online and only require students to demonstrate basic proficiency in the subject, which has caused some to question the academic rigor of the online courses. The district and Gipson have previously defended the academic value of the courses. Over spring break in late March, the district enacted the “Spring Plus” program at 15 high schools that provided resources and dedicated staff to get students back on track, according to Gipson and Alexander’s memo. The program has continued on Saturdays since spring break and is scheduled to be completed May 28. Attendance has varied depending on the day, but 313 seniors showed up at the 15 high schools on the first Monday of spring break. 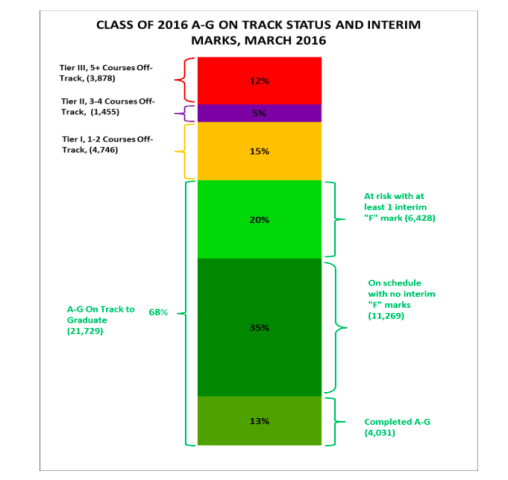 According to the April 4 memo, 21,729 seniors are currently on-track to complete their A-G requirements, but 6,428 — or 30 percent — received an F at the 10-week mark. There are 4,746 seniors off-track by one or two courses, 1,455 off-track by three or four courses and 3,878 off-track by five or more courses. In June, when facing the stark graduation projections due to the coming A-G requirements, the school board lowered the required grades in A-G courses from a C to a D for the class of 2017. (The class of 2016 could always receive D’s for graduation.) The A-G courses, which were first conceived and passed by the board in 2005, are aimed at getting more LA Unified students into California’s public universities. Despite the lowering of the bar, the district has made significant progress since 2005, according to a March 7 memo by Gipson and Alexander that showed 48 percent of all LA Unified high school students are passing their A-G courses with C’s or better. “This shows tremendous growth since the class of 2005, when only 18 percent graduated meeting the A-G course requirements with a C or better,” the memo stated.